Castillo de San Marcos is the oldest masonry fort in the Continental United States, located in St. Augustine, Florida. It was built by the Spanish, but since then has been occupied by several other countries. 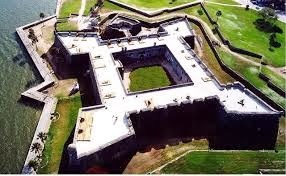 St. Augustine was founded in 1565, with only nine small wooden forts for defense. The town was attacked in 1586 by Sir Francis Drake with 20 ships, causing the Spaniards to realize they needed protection. It wasn’t until 1668, however, when English pirate Robert Searle attacked the town, that Queen Mariana of Spain actually approved the building of a fort. on the corners of the fort (see picture). The bastions stick out and allow soldiers to shoot at anyone whomakes it to the base of any wall. The Castillo is a square, with four bastions that are namedSan Pedro, San Agustin, San Carlos, and San Pablo. There is a moat around it that could be flooded with the use of flood gates. The single entrance to the fort was its weakest point, and was protected by a ravelin. A ravelin is a building external to the fort (see the picture to the right. It's on the top of the picture). This meant that to enter the fort, you had to go along a walkway to the ravelin, turn 90 degrees, qand go along another walkway to get to the fort. Each walkway had a drawbridge, and the entrance to the fort had a portcullis. Outside of the moat is a large hill constructed to make any attackers have to climb up and be level with the fort’s cannons, as well as preventing enemy cannons from hitting the fort’s walls. did not do much harm. The siege ended when Spanish reinforcements from Havana arrived and trapped the English in the harbor. The English burned their ships and marched back to Charleston on land. In 1738, the interior of the fort was redesigned. The rooms were made deeper and the ceilings became arched. The arched ceilings protected the rooms more, and once the exterior walls were raised a few feet, allowed cannons to be put on the gun deck. Nicole and I in a room in the fort. Look at the title of the sign! and said, “Take this to your king and tell him that if he were here I would serve him in the same manner.” This became the reason Britain gave to declare war on the Spanish from 1739 to 1748. The war became known as the War of Jenkins’ Ear. In 1740, British General James Oglethorpe (founder of the Georgia colony) attacked St. Augustine, and 1,300 townspeople once again crowded into the fort. Oglethorpe bombarded Castillo de San Marcos for 27 days. When he realized that his cannons were doing nothing, he decided to blockade the inlet that led to the river so that the people would starve. When supplies and morale got too low, Oglethorpe left. After the Seven Years War, the Treaty of Paris was signed in 1763. As a result of this treaty, Britain gained all of Spanish Florida. 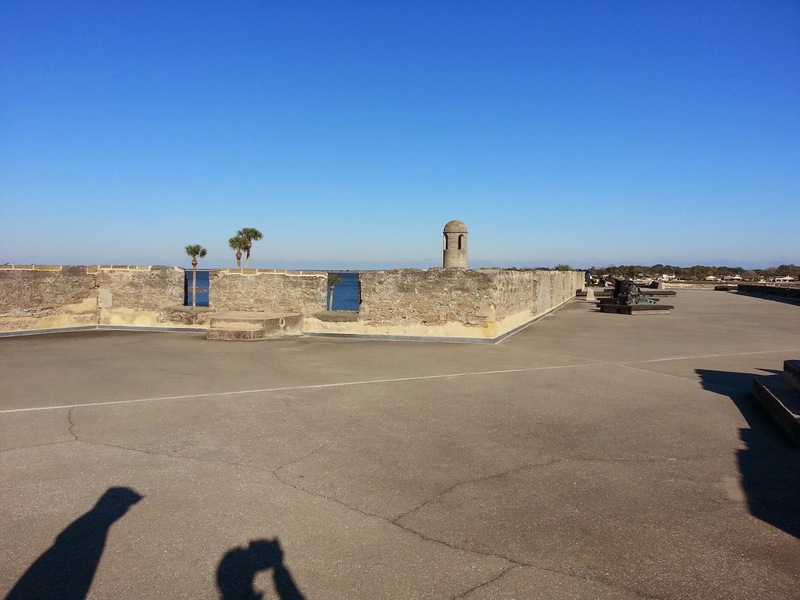 They finally were in control of Castillo de San Marcos. The British renamed it Fort St. Mark and made some improvements, including adding second floors to some of the rooms. During the American Revolution, the British used the fort as a jail. As a result of the second Treaty of Paris in 1783, which ended the American Revolution, Florida was returned to the Spanish. They renamed the fort Castillo de San Marcos and continued to build upon the British improvements. Due to much pressure from the United States, Spanish sold Florida to them in 1821. The Americans changed the name to Fort Marion, and changed nothing much except converting some storerooms into jails. Also, part of the moat was filled in and used as an artillery battery, and hotshot furnace (used for firing red hot cannonballs at wooden ships). A view of the harbor from the gun deck. receipt. The Confederates gave him a receipt, and he left with no trouble. In 1862, the USS Wabash entered the St. Augustine harbor and found no Confederate Troops. The leaders of St. Augustine agreed to surrender in order to protect the town. The Union turned it into a military prison for the rest of its use. Later during the Indian Wars, many Native Americans were held in the prison. Richard Henry Pratt, a Civil War veteran, recruited tourists and local townspeople to teach the Native American prisoners, following the belief of many that the Indians had to be assimilated. In 1898, 200 deserters from the Spanish American war were imprisoned in the fort. Two years later, Fort Marion was taken off the Active Duty roll after 205 years of service under four different countries. In 1924, the fort was named a National Monument. In 1933, it was placed on the National Park Service registry. Nine years later, Congress allowed it to be named Castillo de San Marcos again. 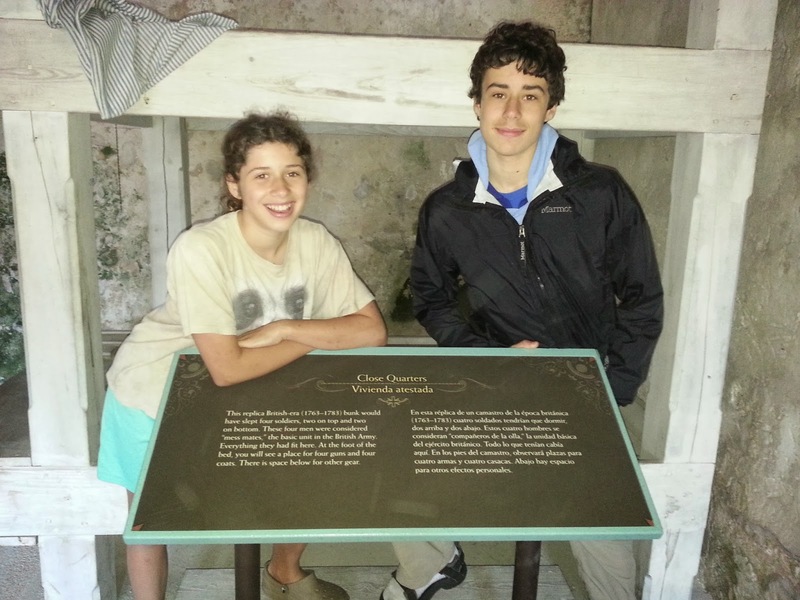 Since then it has been a popular tourist attraction in St. Augustine. 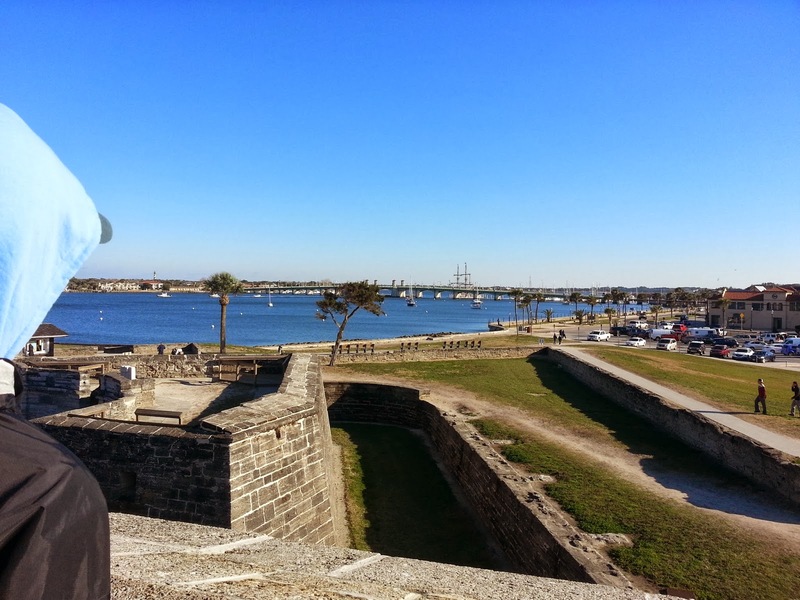 Castillo de San Marcos, also called Fort St. Mark and Fort Marion, is the oldest masonry fort in the Continental United States. It has been actively used for 205 years - under the Spanish, British, Americans and Confederates - in many important wars, and it is a neat place to visit. 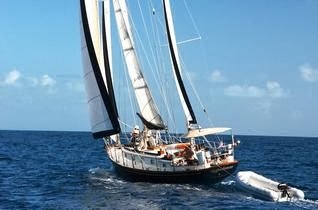 A lot of interesting information, and the pictures should be in a brochure! Most old forts like that are just historic sites; I didn't realize that some had been in use until relatively recently. What did the stone look like? Could you see the little shells? Did they make the stone, or is it made naturally and they cut it from the ground? Can you see it buy the shore? Soon we will have a moat at our house. It is called "driveway in springtime".